The size of your fish tank is important. Whether you keep freshwater fish or saltwater fish, be they tropical fish or marine fish, as pets, they all have one thing in common that needs to be addressed to ensure their home is happy and healthy; the size of the tank. 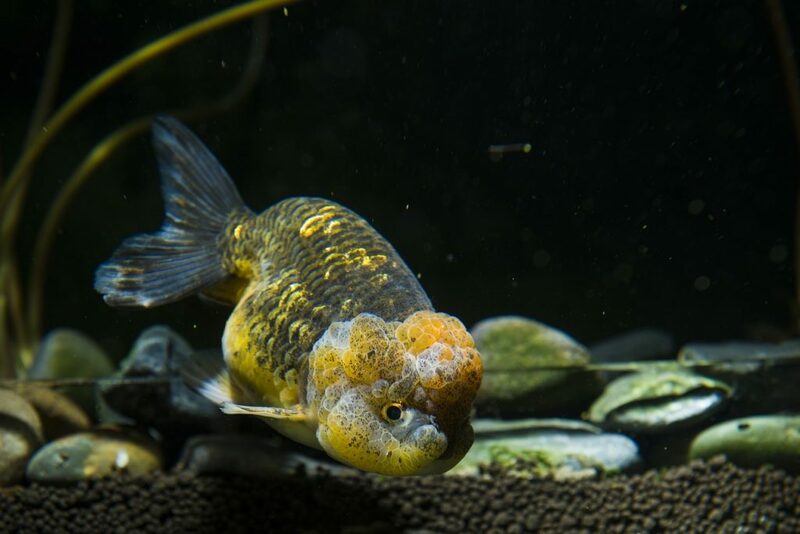 While water types and filtration systems matter as well, you need to make sure you’ve got a tank big enough for the fish you have but not so big that they can’t be happy and comfortable where they live. A 15 gallon fish tank is a way to balance out between the desktop fish tank that holds a few gallons and the larger fish tanks that can hold entire schools of fish. 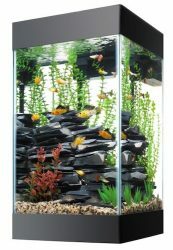 This is the type of fish tank you give your kids when they want to take up raising some fish and a good option for a fish tank in your living room or common living area in the home. It’s bigger than the desktop but not so big that you need to carve out an entire niche in your house to accommodate this tank. Though the capacity of this tank is the first and biggest thing you need to consider, there are quite a few things to keep in mind to ensure you’re making the safest and best option for your fish. 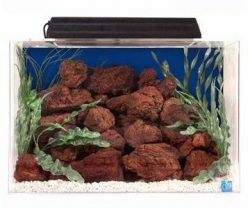 The materials used in making the tank, the filtration system power, and the heating and lamp capabilities are all things to keep in mind while shopping around for a fish tank. There’s going to be a lot of options for variables and accessories across these tanks that all have the same capacity. So keep your eyes on the capabilities and warnings that come with each to make the right choice. This nifty tank actually comes in two size options in the 15 gallon range, 16 gallons and 14 gallons. Considering how most components for fish tanks tier themselves, the few gallons different doesn’t make too much of a difference but if you want options, you have them with this tank. It’s a nicely shaped cube design and fits well into any décor and furniture arrangement. It’s 15 inches by 16.8 inches by 17.5 inches and has quite a few nice accessories and capabilities that make it standout on this list. As the name suggests, it includes a nice LED light and is suitable for both saltwater and freshwater fish. The light can change colors and has a built in 24 hour timer to self-change as needed. There’s an automatic 30 minute sunrise and sunset function, as well as one for moonrise, to help mimic the timing of nature for the fish. The filtration system is compact and promises an easy set up with a quiet submersible pump. The only real thing to keep in mind here is to watch the LED light. Like any bright light, it can be prone to overheating and you’ll want to be mindful of it and watch the timer closely. 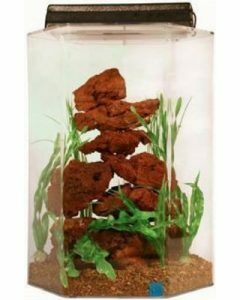 This 15 gallon column aquarium is sized vertical and tall. It’s a column style build identified as the deluxe black model from Aqueon and includes an integrated fluorescent light hood and a set up guide to help make the installation process easier for you. This 15 gallon tall aquarium does weigh a pretty hefty 27.7 pounds compared to many of the other smaller tanks out there and measures 13.6 inches by 13.6 inches by 24.8 inches all the way around. The included fluorescent light hood is a full spectrum T5 light for the best lighting capabilities and safety of your fish and to help grow live plants. There’s also a quiet flow power filter and a feeding door at the front of the hood that makes feeding time convenient and quick. The biggest complaint for this tank is the craftsmanship of the silicon and the seams of the glass. While the functions of the tank work fine and the design of it meets promised standards in pictures, some of the work sealing the glass to the hood is a little bit in need of some TLC depending on how sleek you want your tank to look. But if aesthetic isn’t the end of the world for you, then this is a great option. This 15 gallon aquarium kit is incredibly sleek to look at and very well designed. It’s an incredibly contemporary design with distinctly curved sides and corners and a powerful multi-stage filtration system. It’s got all the right check marks in the looks department and allows for customization across several features, specifically for the included LED light which has an entire spectrum of colors for your fish. 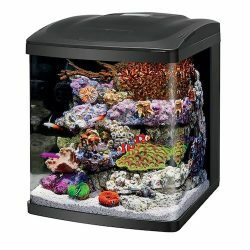 This 15 gallon aquarium sits at a fairly heavy 28 pounds but is, overall, incredibly sleek and easy to place. The 15 gallon fish tank dimensions measures 16 inches by 15 inches by 15 inches and includes a 7500k LED lamp for plant growth and a spectrum of colors for calming moods of the fish denizens living inside. The filtration system includes mechanical, chemical, and biological media for a three stage purifying effect. As for drawbacks? There really aren’t any to speak of for this tank. It works well, looks great, and serves as a lovely house for your fish. The only real issues might be with your own personal needs. It is a bit heavy but it can also fit anywhere you need to place it once its placed. 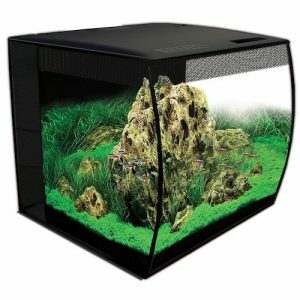 If you want a more traditional looking 15 gallon fish tank, then this is the one for you. The SeaClear features a traditional, low profile look and hexagonal shape with 360 degree view for the fish and yourself. It’s a tranquil design that shows of your fish and the decorations inside the tank with some real gusto. This tank is around the same size as many of the others, 15 inches by 15 inches by 20 inches but it weighs a very moderate 15.9 pounds making it easy to install and move around if needed. The seam work across the hexagon is seamless and the visibility for the fish and for you is very clear. The acrylic is also 17 times stronger than traditional glass and can be used for freshwater and saltwater. It included a 12-inch light fixture as well. The drawback for this tank is that it’s a bit traditional which can also be synonymous with “boring” for some. It’s a safe and dependable tank but it doesn’t have any bells and whistles or customizable features, so if you’re looking for that you’ll want to look elsewhere. If you want the dependability of the previous tank but with a different shape option for your needs in placing it or for aesthetic purposes, then this is the tank that is going to help you out. It’s not a 360 degree view, opting for a traditional rectangular design but it still includes all the safety and dependability of the previous tank. This 15 gallon aquarium dimensions are 12 inches by 24 inches by 13 inches all around and holds a capacity of a solid 15 gallons of water. It’s leak proof and break proof acrylic and includes a light fixture. It can be used for freshwater and saltwater fish as well and includes a lifetime warranty should anything happen. Like the other SeaClear model, the issue here is that it doesn’t include any extra features and is a traditional design. If you’re just looking for something to get the job done then this is the tank for you. But if you want something with more bells and whistles, you’ll want to look elsewhere. First off, know that this tank technically holds a capacity of 13.5 gallons so keep that in mind before you go filling it up. Other than that, it’s a tank right in line with the rest of the ones on this list. And it comes from the trusted Fluval brand. This 13.5 gallon tank measures 20.5 inches by 11.6 inches by 7.4 inches and features a traditional rectangular tank shape with a very modern touch to it. It’s got a very sleek aluminum casing that’s promised to be waterproof and a glass build with included cover. While it doesn’t include a protein skimmer or heater, it does include a 11000k high-output LED light for coral growth in the tank. There’s only one minor drawback with this tank (besides its lack of customization) and that’s the security of the lid. You might want to buy some extra hardware to ensure that the lid is as secure as can be on the tank. Otherwise this is a pretty top-notch buy. 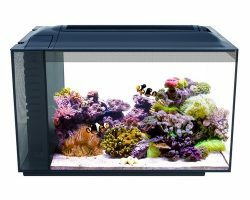 The six options for the best 15 gallon fish tank reviews on this list run the gamut of options (and a couple extra sizes). Some of the 15 gallon fish tanks for sale have customizable features and bells and whistles and some are a bit more straight foreword. So if you want something with all sorts of hook ups or something simple and easy, you have both options available right here. These are some of the best 15 gallon aquariums you could look for. 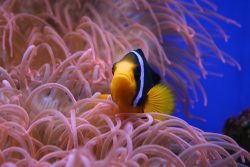 Keep in mind the safety of your fish and plant life living inside your tank and get cracking at creating the perfect home for the marine life you’re raising. Let us know in the comments if you have one of the 15 gallon fish tanks listed here or if you have any questions.